Bacco Pipe Tobacco is a special unique tobacco produced at a quality so good, it rivals top retail brands sold across the US. Made with the finest tobacco grown in the world, the Kentucky Burley Leaf, Bacco Pipe Tobacco has developed quite a reputation as a great, solid and rather premium tobacco at a very low discount price. The leaves in this high quality tobacco are blended together so perfect, they burn evenly throughout every smoke, providing a distinctive smooth taste that is a flawless balance of aromatic and flavor. Bacco premium pipe tobacco is a proven must for smokers who enjoy a good smoke straight from a pipe. Try our most popular smoking pipe tobacco brands today, right here at Smokers Discounts! Bacco Pipe Tobacco is distributed nationwide by Xcaliber International located at One Tobacco Road, Pryor, OK USA. 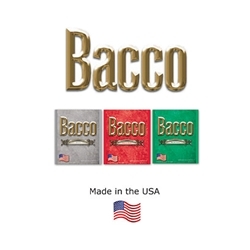 Bacco Pipe Tobacco is available at our online tobacco store in unique styles to choose from. Menthol, Original, and Smooth flavors. Switching to Bacco Pipe Tobacco is a great alternative to expensive and over-priced retail brands. Here at Smokers Discounts we’ve made it easy and affordable to buy pipe tobacco online. Call us for more details!